The mother of all trips, a journey to Chardham is deemed to be an experience of a lifetime. Great spiritual importance is connected with the four sacred places of Chardham in Uttarakhand- Yamunotri, Gangotri, Badrinath and kedarnath. A tour to these destinations will not only wash away your sins but set you free from the cycle of birth and death. But the tour is so difficult that sometimes it becomes arduous for devotees to undertake the journey. To make the journey of the pilgrims more comfortable, helicopter services were introduced. Amongst the most important sites of the Hindus, Chardham is visited by thousands of devotees from distant parts of the world. After the natural disaster of 2013, work on the main roads is still in process but the pilgrimage places are easy to get to. Taking up a Chardham yatra through helicopter will be the best choice for anyone. One can also take a luxury tour to all these sites on a helicopter and get pampered by comfort and opulence. Though there are no 5 star hotels along the Chardham route, devotees can experience luxury and get great delights by taking a ride on a helicopter. Devotees can also avail VIP Darshan facilities, get skilled guides and private chefs to accompany themselves and can experience the pure natural beauty while indulging in a world of holiness. It is an experience that will be etched in your mind for the rest of your life. 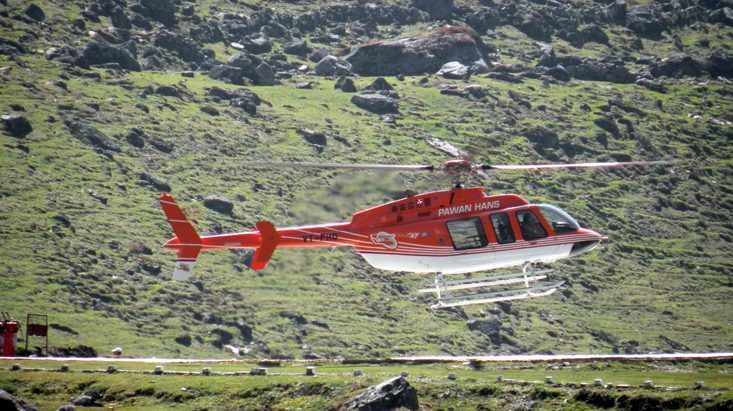 Helicopter facilities to the pilgrimage sites are excellent and, therefore, a helicopter ride is the best option for those who want to save time and complete the Chardham yatra quickly. One will have remarkable memories of the yatra, especially the majestic view of the Chardham with the mighty Himalayas in the background. One must undertake this holy journey at least once in a lifetime to wash away the sins committed in life. We offer attractive Char Dham tour packages to make your journey special and pleasurable of lifetime. Early morning (7.00am), you depart from Sahastradhara Helipad Dehradun to Kharsali; at 8:00 am, you can start the sacred journey to Yamunotri by Pony. The time consumed in the journey to Yamunotri will be approx 4-5 hours. After taking blessing of Goddess Yamuna, visitors arrive at Kharsali. From Kharasali at 1:00pm you set off to Harshil and arrive there at 2 in the afternoon. A road trip to Gangotri is just 12 miles away from Harshil. After reaching, one can attend the aarti and carry out Ganga pooja. Then, back to Harshil. Night stay at Harshil, which is among the most splendid sites in Uttarakhand and is as picturesque as Switzerland. After breakfast, head off for the sacred darshan of Kedarnath, nestled at an elevation of 3584 m above sea level. Arrival at kedarnath at 7:20 am. Relish breathtaking scenery and take the blessings of Lord Kedareshwar. Back to Phata at 9 in the morning. There have your breakfast and then proceed to Badrinath at 11:00 am. Arrival at the holy town of Badrinath at 11:45 am. Check in at a hotel. After freshening up, proceed to Badrinath shrine. There have holy darshan of Lord Badri. Come back to the Hotel. Have your lunch and take some rest. Overnight stay at the hotel. Visit to Badrinath temple for early morning darshan. Carry out pooja at 4 in the morning. Proceed to hotel, enjoy a breakfast and then get ready to head to Dehradun. Arrival at Dehradun by helicopter at 6: 30am. One of the excellent properties in Barkot, Hotel Samrat is the perfect option to stay after a tiring day and frantic traveling schedule. It is situated in a perfect setting with charming sights of Mother Nature. The hotel offers 18 well appointed rooms that come with modern amenities making your stay comfortable and remarkable. Perched in the Himalayas of Kedarnath, Himachal House is among the most popular deluxe hotels in the state of Uttarakhand. Rooms are clean, spacious and endowed with essential amenities like round the clock room service, television and attached washroom having shampoo, shower and linen. Besides this, visitors can dig into an array of exotic vegetarian cuisines served at the restaurant. Take a break from the stressful life and come to a world of pleasure and peace. Hotel Dwarikesh is located in proximity to the bus stand in Badrinath. It welcomes travelers from all across the globe to the holy place leaving one speechless and amazed. Positioned on the banks of the Ganga in the vicinity of Laxman Jhula, Tapovan Resort is a perfect option to relax and unwind in the surroundings of mystic mountains. Guests can pamper themselves with an array of spa treatments offered in the picturesque settings of the resort. The gentle breeze and beautiful scenery surrounding this resort will provide you with an incredible experience that you will cherish forever. Just a mile away from Rudraprayag town en route to Badrinath, Monal Resort offers splendid sight of the majestic Garhwal Himalayas. It is spread over 3 acres of lush greenery of land and offers 52 well appointed rooms, which have been categorized into deluxe rooms, standard rooms, premium rooms and suites. With various luxury Chardham packages to choose from, travelers should go with the one that suits them the most. The tour is sure to render you with religious serenity and reconnection with nature. It is totally a different experience that everyone must try.